Little wonder,” the magazine mused, that “there’s a ton of interest in manufactured housing,” a type of housing it called the nation’s fastest growing. Today’s buyers can get quality and design that rival those of conventionally built homes and prices that are much lower,” the article continued. “And the time it takes to build a manufactured home is measured in weeks, not months. More than half of the homes built by one maker, for example, are built to the customer’s individual order—just the way he or she wants it. There are plenty of options. One manufactured home builder said that by selecting among features and configurations, a buyer has a choice of more than 400 floor plans—in that brand’s line alone. Typically, the buyer can leaf through plans, watching for the home that’s laid out just right—and then request the fine touches that will make it perfect. Manufacturers offer amenities such as fireplaces, dishwashers, skylights, kitchen work islands, basement entry, upgraded plumbing fixtures and more. Some manufactured home communities require awnings, canopies or storage sheds. Sheds protect recreation and lawn equipment. Awnings and canopies, of metal or fiberglass, protect doors and windows from the sun, keeping the house cooler in summer and deflecting rain and snow in winter. Many homeowners add patios, screened porches, carports, driveways, roof overhangs, planters, gutters or downspouts. Steps and skirting that are required in most manufactured housing communities, and by many zoning rules, can beautify a home. On the grounds themselves, the homeowner can add shrubs, hedges, flowers or grass, or create landscape accents with materials such as gravel, crushed brick, stone, or wood chips. Those choices and projects all come after the first steps—deciding on every detail of a new manufactured home. The new homeowner can choose up to four bedrooms and three baths, plus add dormers, porches and bay windows. The exterior can be made of vinyl, aluminum or wood siding. They can have a cathedral ceiling, taped-and-textured drywall and no wax-floors. The homeowners may select or design their own kitchen and bathroom plans. The home is delivered complete, with carpet, drapes, appliances, cabinets and more, making it ready for living. After all, there are several appealing features of factory-built homes. One is that the process is efficient. Another is that it’s “move-in ready” when it reaches the home site. And perhaps the biggest bonus is that by being part of the design process, the homebuyer has already seen the home and knows what it will look and feel like. It sometimes takes a keen eye to pick out new manufactured homes. They offer features such as lap siding and shingled, peaked roofs; optional wide and bay windows, kitchens with custom appliances, fine countertops and island butcher blocks; bathrooms with sunken tubs and other new plumbing features; built-in china cabinets, dressers, high-quality carpet and paneling; cathedral ceilings; even woodburning fireplaces. Want a circular kitchen or hot tub? Chances are, it can be ordered. No one could blame you if, part way into the process of designing your own dream home, you found yourself “floored” by all the options. 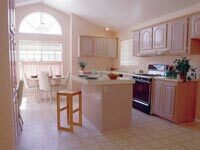 For more information about manufactured homes, visit our web site at www.welcomehomeohio.com or contact the Ohio Manufactured Homes Association, 201 Bradenton Avenue, Suite 100, Dublin, Ohio, 43017-3540; 614.799.2340.